Anyone who’s even taken a passing glace through my archives will probably know that my conversion to Christianity has involved few big emotional experiences. I’m not a very touchy-feely kind of person, to say the least. (I recently had a formal Birkman personality inventory done and it showed that I have this rare personality type where numbers are actually more real to me than reality — go figure.) So I’ve always been a bit jealous of people who have a real emotional connection to God, the type of people who consider Jesus a friend, someone they know. Though I know that big emotions are not necessary for having faith and being a good Christian, since converting I always yearned for a more personal understanding of Jesus; I wished that I could feel an emotional connection to the events described in the Gospels; I wanted more than to just know…I wanted to feel. A while back I was driving around and turned on Relevant Radio. I immediately recognized the smooth, calming voice of Fr. Benedict Groeschel saying something about Jesus’ crown of thorns. After listening for a couple seconds, in a moment of saint-like spiritual maturity, I thought, “Oh, no! Not the Sorrowful Mysteries!” and turned off the radio. I realized that I was listening to one of his recordings of the Rosary that Relevant Radio plays every evening, and I’d learned the hard way that if I didn’t have on waterproof mascara I’d better change the dial post haste on the nights of the Sorrowful Mysteries, because more than about five seconds would leave me sobbing. Not just crying, not teary-eyed, but sobbing. A quick aside before I go on for those of you not familiar with praying the Rosary: the beads on that necklace-looking thing are mnemonic devices for prayer. There are five sets of ten beads, and for each set you meditate on a certain mystery while you pray. So, for example, if it’s the day for meditating on the Sorrowful Mysteries, you’ll meditate on one of the five mysteries (the agony in the garden, the scourging at the pillar, the crowning with thorns, the carrying of the cross, and the crucifixion) for each of your five sets of prayers. Anyway, a couple months ago it began to nag at me that I never pray the Rosary anymore. I used to do it every night, and was surprised at wonderful results I saw in my life. I’m so chronically tired and busy and easily distracted these days that being able to muster up the focus to get through an entire Rosary on any sort of regular basis seemed impossible, so I turned to prayer. I asked God to show me how to get it done. And God quickly gave me the answer. The thought suddenly popped into my head: “Duh. I need to go get a copy of Fr. Groeschel’s recording of the Rosary.” Rather than ignoring it because it made me feel too emotional, perhaps that’s exactly what I needed. Saying the prayers along with someone else would help me focus and get through it, and Fr. Groeschel’s brief reflections on each mystery were obviously very effective at conveying the momentousness of these events. So I went to the St. Philomena Foundation website and ordered a copy of The Rosary Is a Place (available for free, though I did make a donation). And it was, indeed, exactly what I needed. Fr. Groeschel’s thoughts on the mysteries are not overly emotional, he doesn’t try to manipulate the listener through overly graphic images or long descriptions. He doesn’t need to. Those events that transpired so long ago in the Middle East need no embellishment. He simply describes what happened, and reminds us what it all means for the rest of us mortals. And, for me, it made the events real. It made them come to life. Over the past few weeks when I’ve put on my headphones in the quiet of the night to pray and meditate on the Joyful, Sorrowful, or Glorious Mysteries with Fr. Groeschel, I’ve felt closer to Jesus than almost any other time before. Perhaps it’s because the Rosary, a devotion to Mary, encourages us to see the life of Jesus through his mother’s eyes. I may not yet be spiritually mature enough to have a full appreciation of the magnitude of what Christ did for us; but, as a mother myself, to imagine what his Mother must have felt upon seeing all these events of her Child’s life unfold, especially that she knew Who he was, somehow makes it more real, more heart-wrenching, more joyful for me than imagining the events in isolation. Anyway, all of this is a long way of saying that I love Fr. 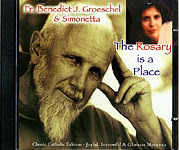 Groeschel’s CD, The Rosary is a Place, and highly recommend it to anyone who wants to deepened their appreciation of the Holy Rosary. Thanks for this recommendation, Jen!! I have similarly had few big emotional experiences (though the ones I have had left me longing for more) and I’m also not a real touchy-feely person (immediate family–that is, husband and my younger children–notwithstanding). I’m sure I could add more disclaimers. But this sounds like just what I need! Along those same lines, I love “Praying the Rosary with St. Therese of Lisieux”. The quotations sink in deeply and actually keep me thinking about what I’m praying. Maybe I should get a copy of that CD. I’ve been trying to say a rosary in the car on the way to work and I’ve found I get very distracted. Something like this would definetly help. This is exactly what I’ve been looking for. I’m off to make a purchase right now, Jen. Thank you.